A number of partners who deliver integrations to e-conomic have been asking us about providing insights for their apps. We store a lot of information regarding the usage, errors etc. related to apps for our internal use. Since this information is valuable to us, it can easily be utilized by partners as well to deliver even better quality, but also to grow their apps. All this has led us to create a new API in the e-conomic portfolio. 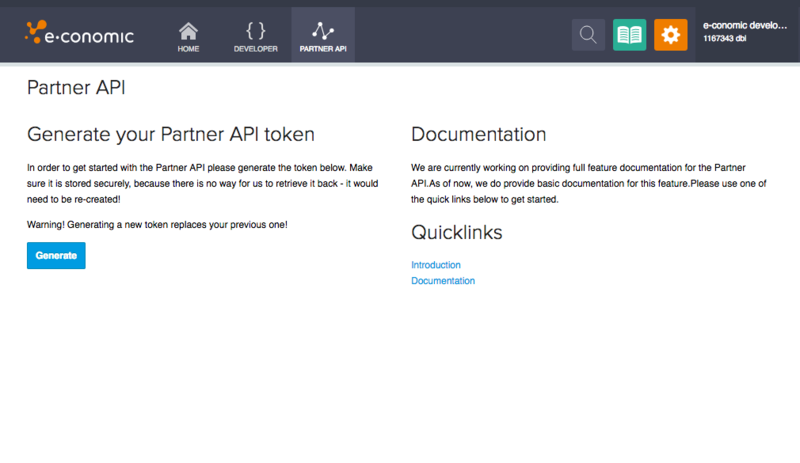 We are proud to announce the Partner API as the new product in our family. What can I do with the Partner API? You are able to view all grant tokens for a given app. In addition to insights about quantity (how many customers are using your integration), it is also possible to see when access was granted and revoked. This allows for in-depth analytics of your integration, providing insights on how your application is used and how your changes influence customer satisfaction. How do I access the Partner API? In order to use the Partner API, you have to generate a new key. To do so, go to you developer agreement and click “Partner API” from the top menu. Then press “Generate” to create the key. Please copy the key to a secure location. The generated key can’t be retrieved – it would need to be re-generated in order to make access work again. Currently we are working on providing proper documentation, below you can find an extract on how to authenticate your requests as well as available endpoints. Please note that Partner API uses different URL than REST API. Authentication requires different headers comparing to the requirements on the REST API. First header is the token that you generate on Partner API from within e-conomic UI, remember to keep your token saved since we are not able to recover it. You would have to re-generate it afterwards if needed. Second header is your developer agreement number. Returns list of all applications under the developer agreement. Among with the Id and name. Returns a collection of grants (number of tokens) that are using given app. Among with the information about when the access was granted and revoked (if different than creation data – it indicates access revoke). Filtering is available on created and lastUpdated properties. In the future, we will be able to provide insights to developers about app usage (rates), errors that are reported by the apps and much more. All of this to provide greater insights to the developers as well as partners and in consequence provide higher quality integrations that meet our customers’ needs. If you have an idea about what can be part of the Partner API, you are more than welcome to share it with us by writing the comment below or contacting our support at api@e-conomic.com.